Availability : We depart almost any day with 2 people; not available in February. Short on time but still want to experience the world-famous Inca Trail to Machu Picchu? Then we have the perfect Short Inca Trail tours for you! 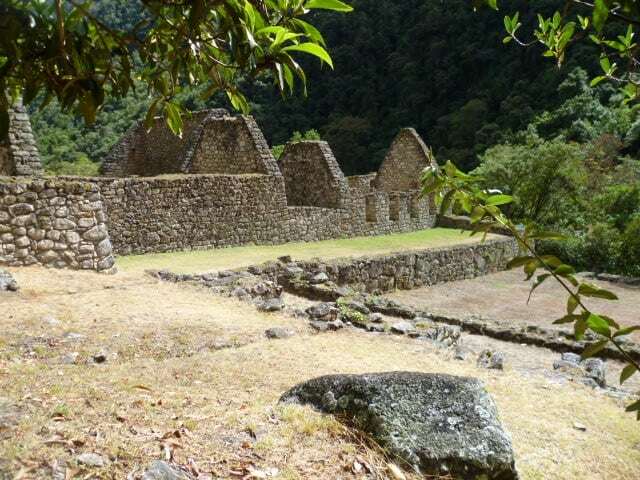 Our Short Inca Trail tour 2D trek is custom-designed to give you a taste of the Classic Inca Trail from Wiñay Wayna to Inti Punku, the famous Sun Gate. Day 2 of this itinerary gives you a chance to fully explore the impressive Machu Picchu citadel. Did you know? Only a special few actually get to hike the Inca Trail to Machu Picchu every year. Peru’s permit system means that just 500 people are allowed on the trail every day – approximately 200 visitors and 300 trekking staff. Permits are sold on a first-come, first-served basis, and are in very high demand: they can sell out as much as 6 months in advance. Once spaces have been booked, NO OPERATOR CAN OFFER YOU A SPACE. All spaces are personal and non-transferable, and there is no waiting list, so if someone cancels, their spot cannot be taken by someone new. Also note that the Inca Trail to Machu Picchu is closed in February for maintenance. 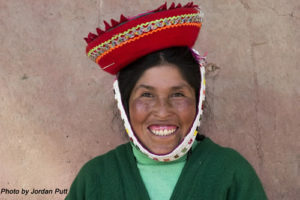 We treat our staff right: The Inca Trail is notorious for the mistreatment of porters and other trail staff who are asked to carry more than government regulation allow. At Apus Peru, we do things differently, going above and beyond these minimums. Read more about how we take care of all our staff, including porters and horsemen. Incredible Inca ruins, spectacular vistas and a wealth of flora and fauna, not to mention, the unparalleled Machu Picchu! 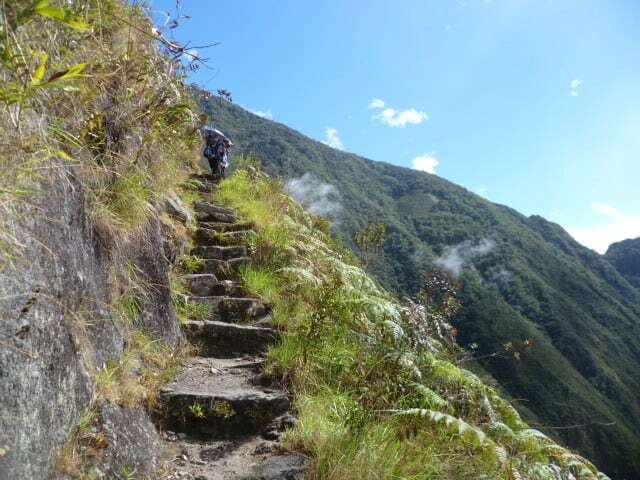 There is a lot of uphill walking on this trek, over the stone steps first laid by the ancient Inca. If you’d like more flexibility in your return travel to Cusco, consider upgrading to the Vistadome train (Executive Class) for an extra $30 per person. This upgrade must be requested at time of booking. This is a non-camping trip, but still requires a degree of fitness and an adventurous spirit. 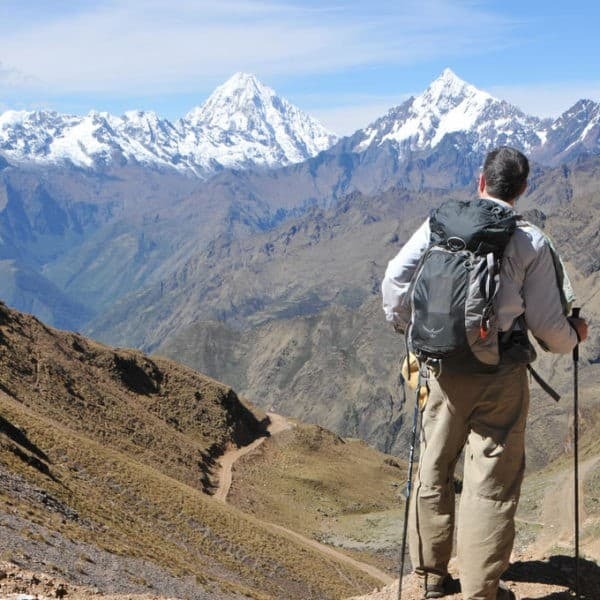 A scanned copy of your passport and a non-refundable deposit must be provided upon booking an Inca Trail trek. This is due to government regulations which require complete passport details and full payment of the Machu Picchu entrance fee in order to issue a permit. Your reservation will only be confirmed when we have your entrance ticket in our hands. If your passport number changes after you book, you must tell us immediately or you may lose your booking. If the name or number on your passport is different from the name or number on your Inca Trail permit, you will not be allowed to start the trek and you will not be entitled to a refund. If you booked a Short Inca Trail tour at a student rate, you must bring your valid student card on the trail with you. If you do not present your student card, you will not be allowed to start the trek and you will not be entitled to a refund, nor given an opportunity to pay the full rate. This trek includes transportation by train from Km 104 to Aguas Calientes and from Aguas Calientes to Ollantaytambo on the Expedition service (Tourist Class), followed by private ground transport from Ollantaytambo to Cusco. If you’d like more flexibility in your return travel to Cusco, consider upgrading to the Vistadome train service (Executive Class) for an extra $30 per person. This upgrade must be requested at time of booking. We start early (5:00 am!) as we travel by car from Cusco to the Ollantaytambo train station. From here, we travel by train on a very picturesque route for 2.5h until we reach kilometer 104, the start of the trail for us. Shortly after crossing the bridge over the Vilcanota River we visit the site of Chachabamba (2050m / 6,725 ft), a lovely archaeological site with water channels and fountains. From here, we will hike upwards for about 8km (approximately 4 hours). The trail is well established, but there are many stairs and the hike is mostly upwards! While this is one of the easiest treks around the Cusco region, you still need to have a reasonable level of fitness to complete it. 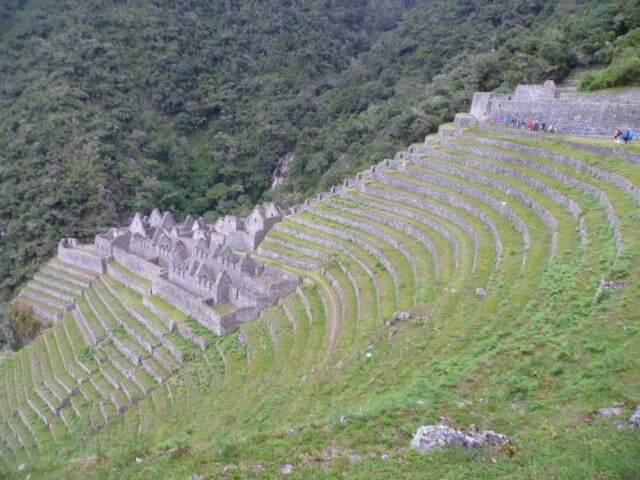 After our upwards climb, we arrive at the Inca site Wiñay Wayna (‘Forever Young’) (2670m / 8,759 ft) This is an impressive complex made up of an agricultural center with numerous terraces, a religious sector, and an urban sector. Many consider this the most impressive site on the whole Inca Trail! After lunch, we continue for about another hour until we arrive at Inti Punku, the Sun Gate (2730m / 8,956 ft), where you will have your first dramatic view of Machu Picchu (2400m / 7,874 ft). After getting those classic photos, we will walk down the last part of the trail towards the ancient city itself. Before entering Machu Picchu, we will take a side path off the trail to go down to Aguas Calientes, as we will visit Machu Picchu on Day 2. From here, we take the bus down to Aguas Calientes. After checking into our accommodations for the night, we’ll enjoy a celebratory dinner and then it’s off to bed, in preparation for the next day’s early start. After an early breakfast at the hotel, we will head for the bus to be on the first trip up to Machu Picchu. Your 4h visit to Machu Picchu can be spent exploring some of the alternative routes, like the Inca Bridge, after which your guide will give you a 2-3h walking tour of the historic citadel. After our site visit, we take the bus back down to Aguas Calientes. From here, we’ll take a train to Ollantaytambo where you’ll be picked up in our private vehicle to return to Cusco. The short inca trail was very educational with beautiful scenery and vegetation, and the physical was moderate (very doable). We particularly loved learning about inca history, traditions, architecture and agricultural expertise from our guide; it was very edifying and inspiring. Our family of 10, ages 8-75, took the KM 104 Inka Trail two day hike and it was absolutely perfect. We boarded the train in Ollantaytambo and got off the train about 1 hr before reaching Machu Picchu. We then hiked the last leg of the Inka Trail through the high jungle and arrived at Machu Picchu by 3 pm. We had a wonderful hike and arrived through the Sun Gate seeing Machu Picchu as the Inka’s did. 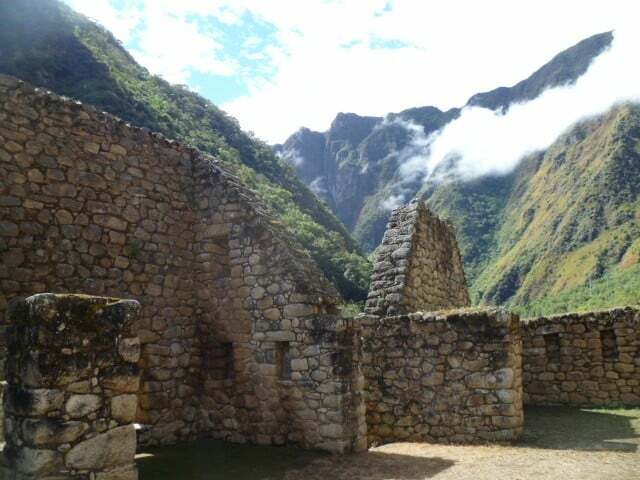 We spent that night in Aguas Calientes and then spent the next day exploring the ruins. We each packed a little overnight pack for that night then returned to Ollantaytambo where we’d left our bags the next Eve. We then continued our tour of the Sacred Valley. Apus Peru made sure everything went smoothly. It was a beautiful, challenging hike, loved hiking to the Sun Gate. Our guide was knowledgeable, prompt, considerate and flexible. We knew we wanted go to Machu Picchu but we weren’t sure how to get there — with my wife, me and our two teenaged children. Apus Peru was the perfect guide. They made all of the arrangements, provided a friendly, well-informed guide and gave us the experience of a lifetime. I highly recommend Apus Peru. They were great about staying in communication before our trip. They helped us select a trek that was appropriate for our family. We wanted to do some hiking but we felt the 4D trek might be too much. Our guide was extremely well-informed about the region. He grew up in Cusco and talked about first visiting Machu Picchu as a toddler. He gave us great insights about the site. During the trek, he allowed us to walk at our own pace and informed us about the local fauna and history. Apus Peru provided us with excellent lodging in Aguas Caliente and delicious food at high-quality restaurants. Overall, this was a wonderful, memorable trip with a top-notch guide.